State night is back! 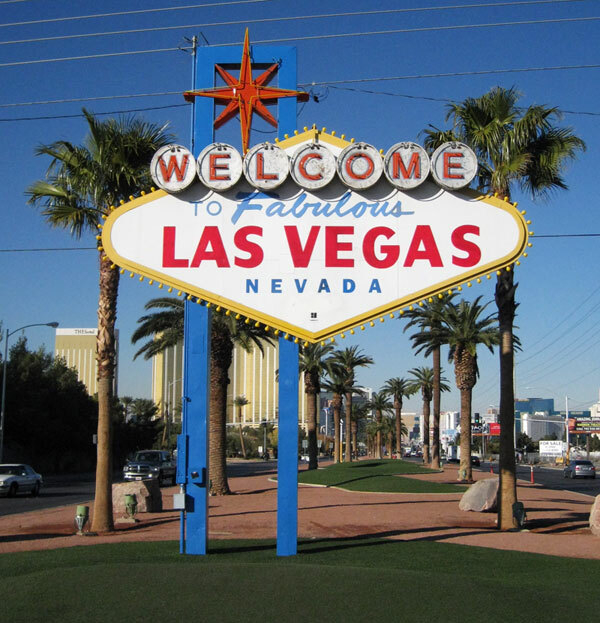 This week we wanted to see what the Silver State had in store for us. Las Vegas as we all know is known for its endless buffets and high-end steak houses, but we thought we’d venture a bit beyond Vegas. In researching the local produce we came upon many references to the pinyon pine nut. The pinyon pine nut has a rich history in Nevada where it sustained the native people of the Great Basin for thousands of years. In fact, we read that it was the primary source of protein for the Shoshone, Paiutes and Washoe nations. We’re no strangers to pine nuts, but we’ve never had a U.S. grown pine nut. Sadly we won’t tonight either as they’re not available around here, but based on the reviews, you can bet we’ll be trying them the next time we head to the Southwest. 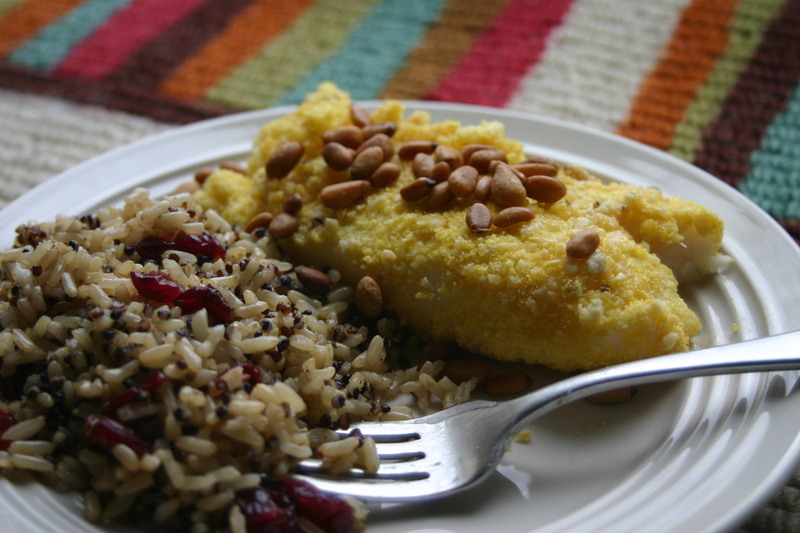 As for tonight we’re going to make do with our pine nuts imported from China and whip up a Paiutes inspired Pine Nut Crusted Cod and a Spinach, Portabello and Pine Nut Salad. First we tossed the pine nuts with the spinach. Then we sautéed the portabellos with olive oil, balsamic vinegar and oregano. 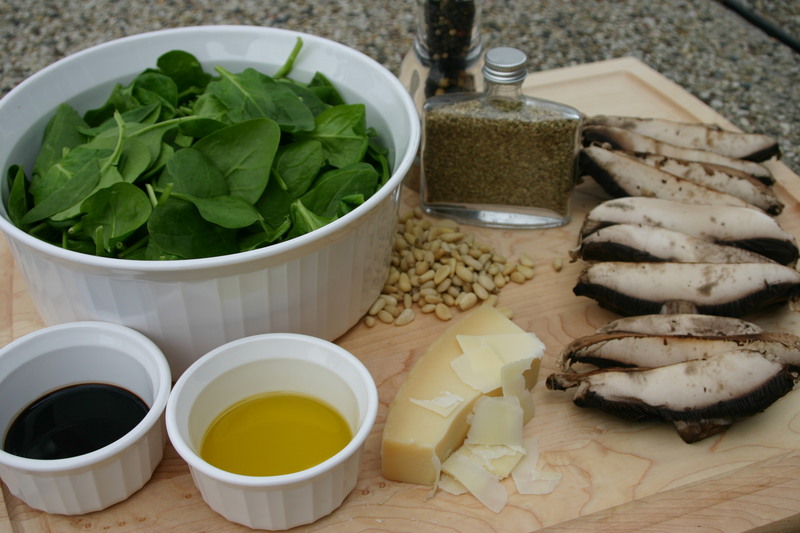 We then added the portabellos over the spinach, added some shaved parmesan and ground pepper. We served the salad with olive oil and balsamic vinegar. (Well, dad and I did. 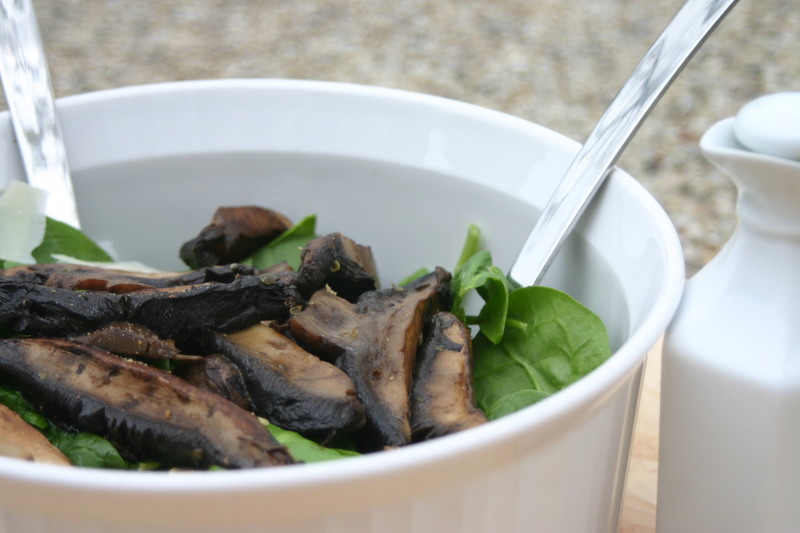 Mr. N and Miss A opted to leave the mushrooms out and used their own favorite dressings.) Voila! Salad is done. We then moved on to the fish. A trout would have been more true to Paiute cuisine, but we used a cod tonight. First we toasted a 1/4 c of pine nuts in the oven until golden brown. Then we ground another 1/2 c of pine nuts using the mallet (I got to wield the mallet tonight!) and combined it with corn meal, salt and pepper. 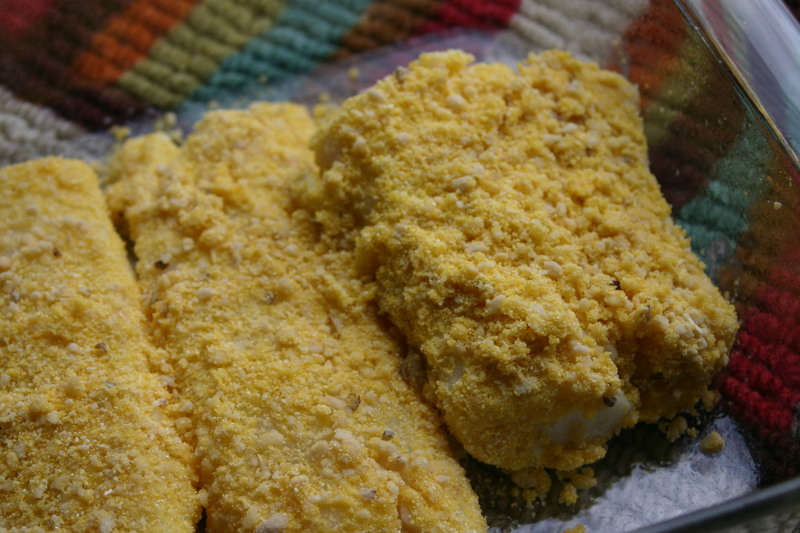 We dipped the cod in whisked egg and coated with the nut/corn meal mixture. We then baked the fish for 25 minutes at 350F. As the fish was baking we melted some butter over medium heat and added some lemon juice. When the fish was done we drizzled the butter over the fillets and sprinkled with the toasted pine nuts. Thanks Kathryn! We’re having a ball and glad that you enjoy reading our adventures. Have fun with your sister’s little one…it’s so much fun when they first start to eat foods – the expressions are priceless! The kids and I love cod too. I’ll eat pretty much any kind of fish, but the kids mostly prefer cod. 🙂 Have a great night! Why no pics of A smeared with cottage cheese??? If she had more than her big girl underpants on, I probably would have! 😉 She took her shirt off at dinner…At first I thought it was so that she didn’t get it dirty, but I’m beginning to wonder if it was for the sole purpose of painting herself with food. I love your recipes. But I really love your stories even more. The visual of Miss A and that cottage cheese is priceless. Thank you for sharing. Thank you Alison. Miss A is priceless. 😉 I’m always amazed at what she manages to get herself into. I am quite proud of Mr. N’s appetite, and I am quite sure she wears cottage cheese very well. This is a meal I think I must try–yes, I will eat fish! Nice pics. The Pine Nut crusted cod looks interesting. Thank you Patty. And thank you for stopping by and reading. The pine nut crusted fish was good. Not my favorite way to prepare fish, but it was enjoyable. If it was fall I would have made my favorite way recipe to for pine nuts – a pumpkin risotto though. Mmmm. Have a great night! 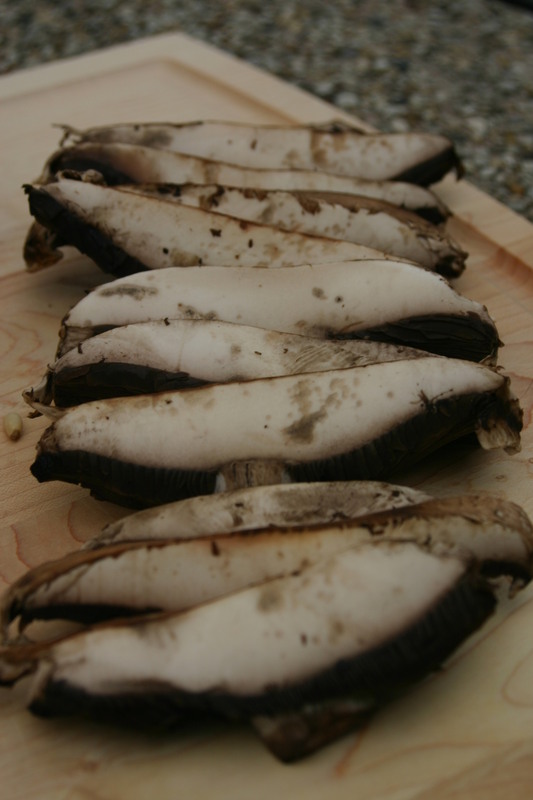 I LOVE portabellos. I still remember the first time I had one…at an Italian restaurant. Still haven’t figured out that recipe – but I have come close.